The sequel will continue to travel around the world interviewing several of the million climate refugees now on the run, along with scholars, politicians and the like, “Climate Refugees” brings to light the heart-wrenching truth of what is quickly becoming humankind’s greatest challenge and a huge security risk for G8 countries. A cautionary tale, the film will demonstrate that climate change isn’t a political issue; it’s a geopolitical one, one that literally transcends the concepts of nationhood and ethnicity. Though on-camera film crew conversations, off-camera narration, sit down interviews, visits to compelling locations, sweeping magical landscape drone footage, and events, the series will take viewers on a journey across America and unto the frontline battle of the climate struggle. The original “Climate Refugees” was the centrepiece film at the United Nations, screened at The White House, The House and Congress, The Pentagon, DAVOS, The Vatican, received many domestic and international awards. It is also the highest rated documentary about climate change on IMDB. The film had its world premier at Sundance Film Festival and then on Netflix. “Climate Refugees” is a “resounding wake up call for every human being to go green immediately. It is a must see film that puts the human soul in the science of climate change.” Sherri Quinn, National Public Radio. Netflix, Hulu, Amazon Prime, CNN, PBS. Influencer based outreach will distribute short video links via Instagram, Facebook, Twitter and Snapchat to over 200 million viewers worldwide. Interfaith groups across America have agreed to screen the film in 20,000 plus interfaith churches, temples, faith congregations. 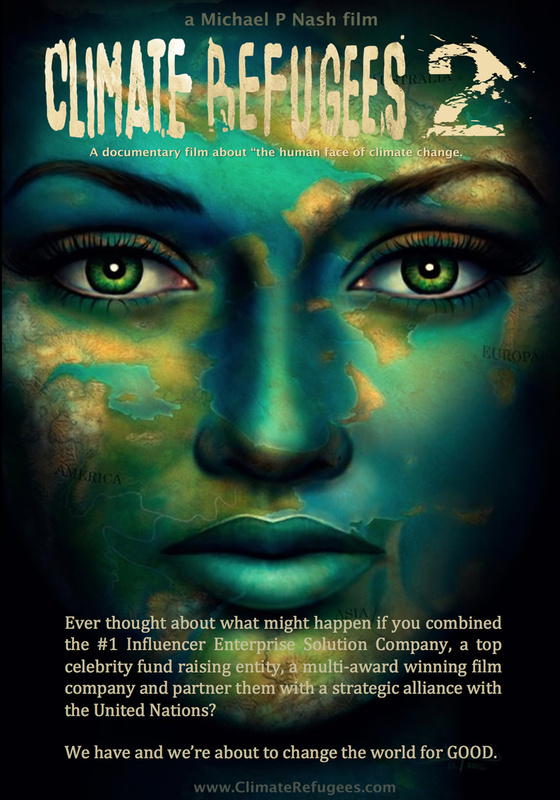 Our first of a kind, grassroots launch will drive the film to hundreds of millions of young people; as several of the top female influencers in the world, our “Earth Angels” become an instrumental source of enlightenment as they spread goodwill of important documentaries and issues to their fans around the world. Once the film is completed, it will become a solutions based instrument for change and will be screened in faith congregations around the world, high level governments, organizations, foundations, universities, film festivals, networks and the like. Our mission is to create a film that becomes a tool for the interfaith-centred call to action bringing all of God’s shepherds to unify, manifesting a smarter more sustainable life forward. It should be noted that the filmmakers attached have a very high success rate with helping write and/or creating change on new policy with their call to action film platforms. The multi award winning filmmakers, talent and crew have created films that have been nominated for Academy Awards, won multiple Emmys, have been a huge force in the largest film festival market including top awards at Sundance, Cannes, Berlin and Toronto. Their films and TV projects have screened in theatres, television networks, Netflix, iTunes, Amazon, globally as well as at The White House, The Pentagon, The Vatican, DAVOS and universities around the world. Writer, Director, Producer – Michael Nash is a Irish/American filmmaker who MovieMaker Magazine named Nash one of the “Top 10 MovieMakers Of The Planet”. Nash founded Beverly Hills Productions over a decade ago, and recently an honored recipient of the Social Change Global Institute Filmmaker of the Year Award, the California Conservation Champion Award and the Neiman Marcus Humanitarian Visions Filmmaker Award. Nash has recently finished three documentaries soon to be released, HomeBase (about 2nd Hand PTSD) a co-production with Harvard Law School Global Negotiation Program, Life Is A Movie (the journey of Larry Moyer and Shel Silverstein) and The Messenger, a documentary about Muslim filmmaker Moustapha Akkad 1977 film about peace. Nash’s multi-award winning Climate Refugees was the only film screened by the United Nations at the recent IIEA Copenhagen Climate Change Conference and Davos for world leaders and policymakers. Climate Refugees had its world premiere at the Sundance Film Festival in Park City, Utah, and was noted by Robert Redford in the NY Times “as an agent for social change.” The film went on to win multiple awards both domestically and internationally. In 2017, Nash was instrumental in the inter-faith distribution of Leonardo DiCaprio’s film Before The Flood. Executive Producer - Stephen Nemeth formed and heads up Rhino Films, the independent film company that originated as a division of iconoclastic record label Rhino Records. He has produced and executive produced dozens of films and named one of the “Top Ten Prolific Producers in Hollywood” by The Hollywood Reporter. His Producer credits include the critically acclaimed The Sessions starring John Hawkes, Helen Hunt and William H. Macy winning Sundance 2012 Audience Award, 2013 Academy Award nomination for Hunt, Fear and Loathing in Las Vegas , Why Do Fools Fall in Love (starring Halle Berry), Dogtown and Z Boys, Flow: For The love Of Water, Climate Refugees, Fields of Fuel, War Dance. He is in pre-production on the adaptation of the New York Times bestselling book Confessions of an Economic Hitman.